Ah, the great outdoors! With summer in full swing, we tend to spend less time indoors and more times outdoors. As pet parents, our pet’s probably don’t mind this at all! There are a lot of fun activities to do with your family that you can include your pets this summer. 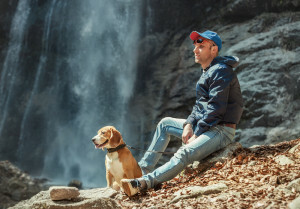 Here’s a list of fun summertime activities that you can bring Fido to. Float Trip: It’s tough to beat a day on the river or lake! Make sure your pet enjoys the water, or else the float trip might become a full day of anxiety and stress for your pet. out new and exciting places. Just make sure to bring water for you and your pet. Dog Parks: This time of year is perfect to meet up with friends at the local dog park to play and socialize with others. Being outside sniffing, running, swimming and rolling around are some of the best parts of summer. Before you jump off the couch and grab the leash, make sure you have all the right necessities. TropiClean’s Natural Flea & Tick line includes shampoos and sprays to ensure your pet will enjoy the outdoors without the irritating bites. TropiClean’s Natural Flea & Tick shampoo and AfterBath Treatment and sprays will kill Fleas & Ticks by contact guaranteed. Get out and enjoy nature with your family and pets. For more information on TropiClean’s Natural Flea & Ticks Products click here. Enjoy the summer! Sesame Seed, Clove, Lemongrass, Cedarwood and Cinnamon oils are used to create our Natural Flea & Tick products. There is no pyrethrins or permethrins in our formula.